Jack Beard (left) and Orion Marshall (right) combined for 7 RBI while striking out a combined 5 over 4 innings in a 22-18 win. Photos by Josh Belanger. 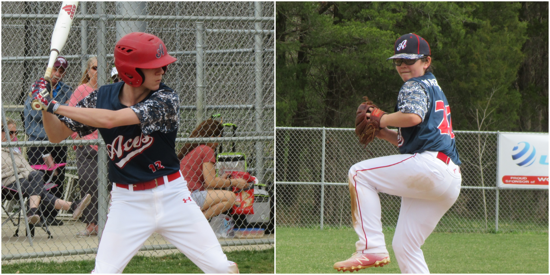 Jack Beard and Orion Marshall combined for six hits and seven RBI for the Loudoun Aces Blue 12u in a 22-18 win over the Mount Vernon Patriots 12u yesterday in a game that had 12 extra-base hits and 32 combined hits in five innings at McNaughton Park. The Aces came out swinging, scoring eight runs in the first three innings with Beard and Marshall each driving in a pair of runs. The Patriots would answer with five of their own through the first three frames, highlighted by a three-run double from Hudson Grimsley in the third. Trailing 9-6 in the fourth inning, Tyler Orth smashed a grand slam that landed in the trees over the left field fence to give the Patriots their first lead of the game. Grimsley would later follow with his fourth RBI of the game to make it a 12-9 ballgame. The Patriots would threaten with six more runs in the fifth, sparked by a bases-clearing triple from Noah Gizzarelli, but could not overcome the 13-run fifth-inning from the Aces. The Aces turned the lineup over and smashed 10 hits, capped by a bases-clearing double from Aaron Van Tuyle. Mike Janicki Jr. and Evan Lee also drove in multiple runs for the Aces while Jacob Martin scored four runs from the leadoff spot in the lineup. All 10 players came around to score at least one run while five different players drove in multiple runs for the Aces. Marshall started on the mound for the Aces and struck out three over 2.2 innings. Beard, who came on in relief of Owen Brundage in the fourth inning, recorded the final four outs of the game with a pair of strikeouts. Gizzarelli, Grimsley and Orth provided most of the firepower for the Patriots with a combined 12 RBI. Quinn Snyder and Logan Schmauder also drove in a pair of runs while Justice Lambert, Ben Reid and Ryan Chicoine combined for six runs for the Patriots. The Aces swept both games of the doubleheader with a 7-4 victory in game two. Both teams will be back in action next on Sunday with the Aces taking on the West Virginia Wild and the Patriots playing the Burke Bulldogs.